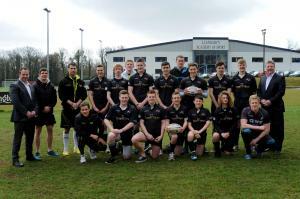 South Gower�s magnificent rugby display wins great admirers overseas and at the Ospreys. South Gower RFC (under 16’s) completed their finest ever season with a successful tour of Holland and an academy of sport meeting with the Ospreys squad. After a great Osprey’s cup campaign which saw them winning their pool and then losing narrowly to Bridgend Athletic in a closely fought semi final, the team embarked on their Dutch adventure sponsored by Peter Lynn & Partners and Physiotherapy Wales. On Easter Saturday the team played in a tournament at RC Hookers on the outskirts of Rotterdam and played some sublime open rugby to lift the winner’s trophy late Saturday afternoon. The following day the team headed north to Amsterdam to the RC Hilversum sport park to compete in a second tournament featuring teams from all over Europe. Once again the squad produced some free flowing rugby to beat teams from England, Holland and Lithuania winning their pool to reach the semi final of the competition. Unfortunately a catalogue of injuries over the 2 days took their toll and the team were narrowly beaten by the eventual tournament winners - Harlow RFC in a closely fought semi final.